San Juan, Oct 28 (IANS) Former US presidential hopeful Bernie Sanders travelled to Puerto Rico to meet with officials and get a first-hand view of the widespread damage caused by Hurricane Maria. Puerto Rico Governor Ricardo Rossello received the Vermont Senator at San Juan’s Luis Munoz Marin International Airport on Friday, reports Efe news. Sanders later joined San Juan Mayor Carmen Yulin Cruz on a tour of Playita, an area in the capital city which was one of the hardest hit by hurricane Maria, the most powerful storm ever to strike the island. The Category 4 hurricane slammed into Puerto Rico on September 20, knocking out water and power and rendering most of the island’s roads impassable. More than 50 people were killed. 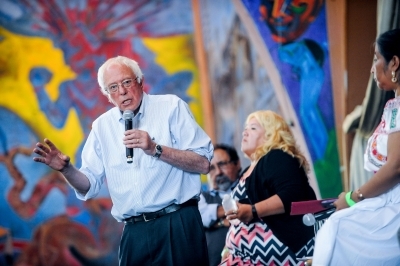 “I want the people in Puerto Rico, as well as those in the Virgin Islands, to know that they are not alone, they have not been forgotten,” Sanders said in Playita. “Only 26 per cent of Puerto Rico has electrical power and around 90 per cent of the US Virgin Islands is still without any electricity. At a subsequent joint press conference with Yulin, Sanders joined the mayor in denouncing the awarding of a $300 million contract for repairing Puerto Rico’s power grid to a firm whose main investor made contributions to President Donald Trump’s 2016 campaign. State-owned utility AEE’s decision to hire Whitefish Energy Holdings was controversial in Puerto Rico even before the Daily Beast reported on Tuesday that the firm behind Whitefish, HBC Investments, was founded and led by Joe Colonetta, who donated more than $50,000 to the Trump campaign and the Republican National Committee. “It smells bad,” Sanders said of the deal, pledging that he and his colleagues on the Senate Energy Committee would closely examine every aspect of the contract with Whitefish, a Montana-based firm with only two permanent employees.